07 June 2018, 13:01 p.m.
Dan Omachi, Software Engineer at Apple, explained during a session at WWDC that OpenGL was designed 25 years ago. 3D rendering has changed fundamentally since then, including things such as multithreaded operations and asynchronous processing. While most platforms are supporting modern APIs such as Vulkan for cross-platform development, or DirectX 12 for Microsoft’s platforms, Apple decided it would create Metal to optimise for its platforms and processors. Few can argue against Metal’s creation — it’s a fantastic, well-optimised API offering great performance — but it’s clear many developers feel it was too early to deprecate OpenGL. 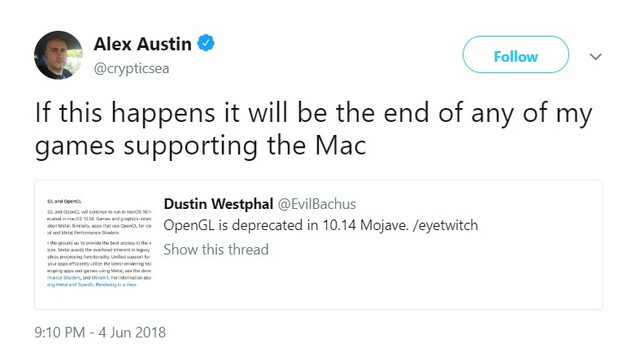 OpenGL’s deprecation means it will remain in each of Apple’s operating systems for now, but it will no longer be updated. At some point, it will be removed – but Apple is yet to provide a date. The company recommends all new games are built using Metal. Metal is supported by popular third-party engines such as Unreal, Unity, and Lumberyard. It is also supported by Apple’s own frameworks like SpriteKit, SceneKit, and Core Image. Game developers looking to switch from OpenGL to Metal are well supported, but it will undoubtedly have a big knock on PC-to-Mac game ports. 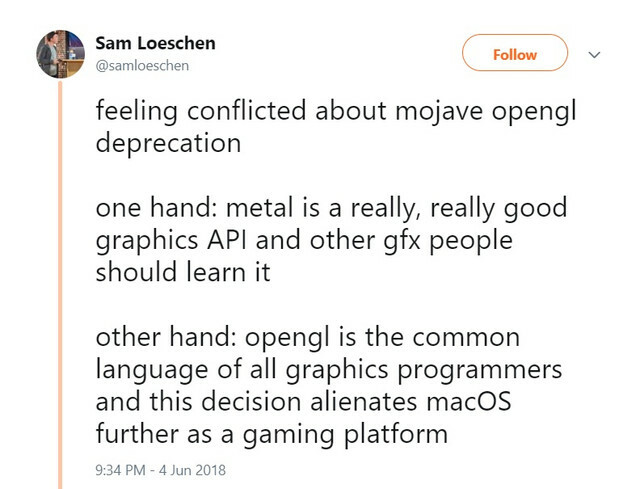 What are your thoughts on Apple’s decision to deprecate OpenGL? Let us know in the comments.